Capsium and Aloo together make a good combination.Bought few capsicum of different colors to make a stuffed Capsicum but changed my mind in making the Stuffed Capsicum Salan for Plain Biriyani Rice.Usually I make Salan to go with Dum Biriyani...to enjoy the taste of Aloo n Capsicum I made Plain Biriyani.Here is the recipe. 1.Heat Oil in a pan,when hot add chopped onions,when they turn transculate add the washed frozen peas and now add the mashed potato and mix well,Add in the dry powders like turmeric powder,garama masala powder,salt n chilli powder according to ur taste.Mix well and fry for 3-4 mins so that the raw flavor vanishes,when done put it aside. 2.Wash the capsicums,pat then dry and now cut the top portion of the capscium and remove the seeds from the capsicum and apply little salt inside the capsicum and then stuff the potato masala into the capsicum ,repeat the same with all the capsicum and put aside. 3.Take a wide pan,pour 5 spns of oil,when hot a add the stuffed capsicum and cover with a lid,cook till the capsicum turns smooth on all sides,keep turing the capscium so that it is cooked evenly all over. 4.When the capsicums are cooking,meanwhile let us make the salan,for which U need to roast groundnuts and seaseme seeds,let them cool and now blend this to a smooth paste. 5.Add 2 spns of oil to pan,when hot add onions and fry till golden brown,now add the ground seaseme and groundnut paste,fry for 2 mins.Add in the coriander powder,garam masala powder,cumin powder,salt and chilli powder to taste.Stir well and cook it covered for5 mins. 6.After 5 Mins add the tamrind juice cook for another 5 mins,finally add in the beaten curd,stir well and cook it covered till oil oozes out. 7.Now add the fried Stuffed Capscium and cook on medium flame for another 8-10 mins and now the dish is ready to serve.Finally garnish it with Chopped Coriander. Serve it hot with any Chapathi/Pulka or Rice. Made it specially to send it to AFAM-Bell Pepers Event by Priya. 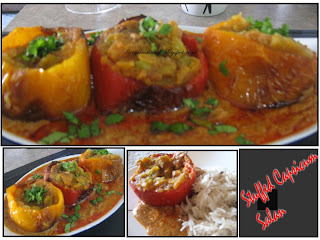 even i was planning to make stuffed capsisum, the dish looks yummy! oh yum!!! Stumbled on your food blog and must say it is awesome!!!! I will be a regular visitor now.